Newark, NJ-August 2, 2018-Mayor Ras J. Baraka and Public Safety Director Anthony F. Ambrose announced the purchase of 46 new fire, public works, and sanitation vehicles, unveiling some of them, including new aerial ladder fire trucks, at a press conference today, in front of City Hall, at 920 Broad Street. 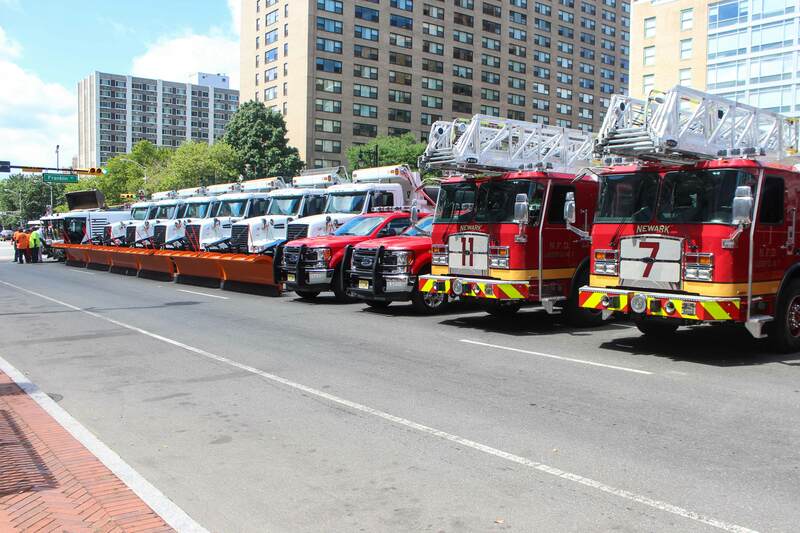 The City is deploying three new custom 110-foot aerial ladder fire trucks, seven new Haz-Mat fire vehicles, 11 new sanitation dump trucks, nine new street sweepers, six agency vehicles, three Volvo Front-end Loaders, two International Medium Dump trucks, three Chevy Mason Dump Trucks, and two Ford Utility Bodies – the last seven vehicles all with plows and salt spreaders – at the event. The new Haz-Mat Fire vehicles are Chemical, Biological, Radiological, Nuclear and Explosives capable. They are also equipped with an on-board Panasonic “Toughpad” computer, loaded with the latest Emergency Resource Guide for identifying and addressing hazardous materials. The vehicles are also equipped with a portable radiation detection meter; a cache of Duo-dote injections for first responders—to reverse effects of biological agents that could be used as part of a terrorist attack; the latest mobile communication radios; LED response lights; new low-tone sirens for enhanced safety; and custom-built, slide out storage cabinets featuring a command center to support an Incident Commander and to stow firefighting gear. The vehicles were purchased using year 2015 and 2016 Urban Area Security Initiative (USAI) federal grant funds at a total cost of $539,000 or $77,000 per vehicle, and at no cost to the City of Newark. The new custom-made 2018 E-One Metro aluminum aerial ladder trucks, extending 110-feet, are designed to fit in tight urban roadways due to their short jack spread of 11-feet; which facilitates their use on narrow city streets. They also feature a cab with a roll cage to keep a firefighter safe; custom compartments for the storage of specialized equipment; custom emergency lighting and siren package; and additional space for 163-feet of ground ladders to access areas that cannot be reached with the aerial ladder. The ladder trucks were purchased through a capital bond project for a total of $2,059,302 or $686,434 per ladder. The City of Newark’s Department of Public Works has also purchased 11 new Volvo dump trucks featuring plows and salt spreaders; nine new street sweepers; and six Dodge Journey SEs for agency use. The five dump trucks and two Utility Bodies are equipped as snow plows and salt spreaders to address winter blizzards.